GEO-TEXTILE FABRICS "Stop Erosion Before It Starts"
Gabion Supply offers DURA-TEXTM geotextile fabrics in a wide range of materials and thicknesses: DURA-TEX ... is the highest quality available in 4 oz/sq yd (light weight), 6 oz (standard weight), 8 oz (heavy weight) or 16 oz (x heavy weight) non-woven needle punched geo-textile fabric. Each fabric is made of 100% polypropylene staple filaments to form a strong fabric that retains its dimensional stability, adding years to the life of any gabion wall, roadway, railroad or landfill project. 6 oz nonwoven geotextile fabric is a medium weight (standard) filter fabric commonly used for a wide range of erosion control, drainage and filtration applications. Constructed of a needle-punched polymer fabrics offer the perfect blend of strength, filtration and drainage. 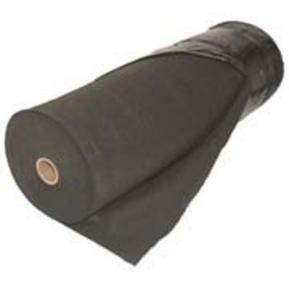 GN60 geotextiles are sold by the roll in sizes of either 12.5 ft. by 360 ft. or 15 ft. by 300 ft.
8 oz non-woven geotextile fabric is a heavy weight filter fabric commonly used for a wide range of erosion control, drainage and filtration applications. Constructed of a needle-punched polymer fabrics offer the perfect blend of strength, filtration and drainage.